No sink full of dirty pans is needed for this easy meal. 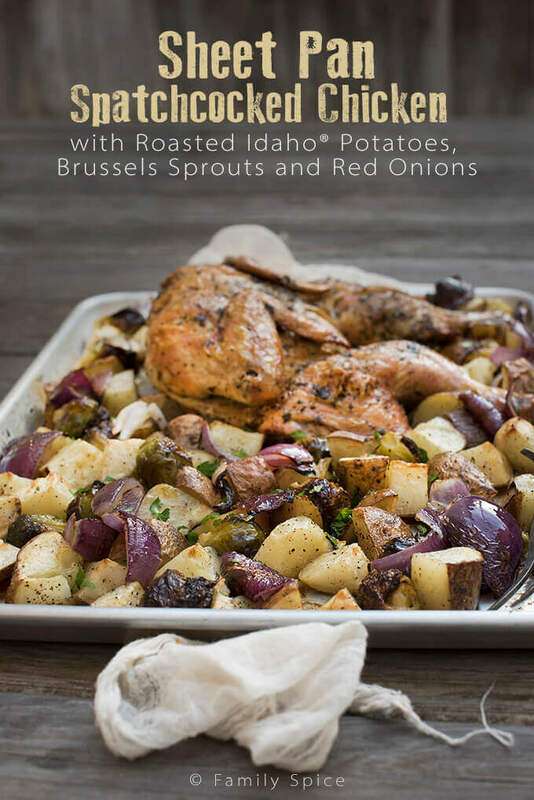 This One Sheet Pan Spatchcocked Chicken with Idaho® Potatoes and Vegetables is all it takes to feed your family. Sponsored by the Idaho Potato Commission. This is the third recipe that I am sharing with you for the promotion with the Idaho Potato Commission, where I was asked to develop four recipes using a 10-pound bag of Idaho Potatoes that would feed a family of four for $25. So far I have shared my Chicken Pot Shepard’s Pie and my Potato Gumbo. 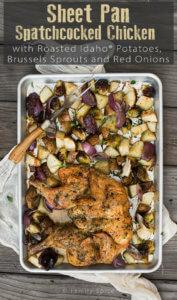 Today I am sharing a super easy meal that requires very little clean up: Sheet Pan Spatchcocked Chicken with Idaho® Potatoes and Vegetables. Sheet pan recipes are super popular on Pinterest and the internet, and why not? 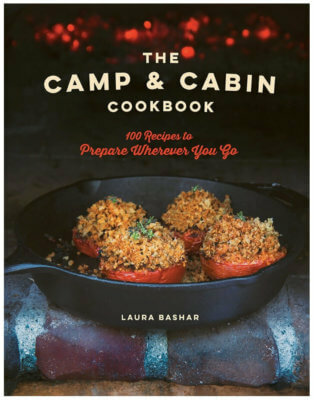 Just like one-pot recipes, everyone is looking easy, delicious recipes that can feed their families without breaking the bank or their backs. But in this recipe, a simple baking sheet and your oven is all the equipment you need. One of the bargain meats I have found when shopping is the whole fryer chicken. It is typically less expensive than cut up chicken. With a sharp knife and a little muscle, it’s easy to cut up a whole chicken into smaller parts and save money in the process. My favorite way to cook up a whole chicken is to butterfly it, or spatchcocked chicken. By cutting out the backbone, you press the chicken flat and crack the breastbone. Chicken is cooked up faster this way and everyone gets some of that crispy skin (you can do this with turkey, too!). And sooo much cheaper than buying a cooked rotisserie chicken. I roast chicken on half the pan and the veggies on the other half. Spatchcocked chicken takes about 45 minutes to roast. Vegetables vary in roasting time. I add the potatoes with the chicken to the pan to get a head start in the roasting. After 15-20 minutes, I add in the Brussels sprouts and red onions. Super easy, healthy, cheap and ready in under an hour. This meal cost only $4.97 in ingredients. You can add more flavor by marinating the chicken in beer or stuffing herbs and garlic under the skin. I always have garlic in the house and by growing my own herbs, I always have them when I need them and it doesn’t cost me a lot of spare change, either. If you have an flavored salts in stock, you can also use that to season your chicken and vegetables. Of course, you can use this recipe for cut up chicken, just make sure it is bone-in chicken and reduce roasting time to 30 minutes. And if you are not a fan of Brussels sprouts, substitute with mushrooms and bell peppers. No sink full of dirty pans is needed for this easy meal. 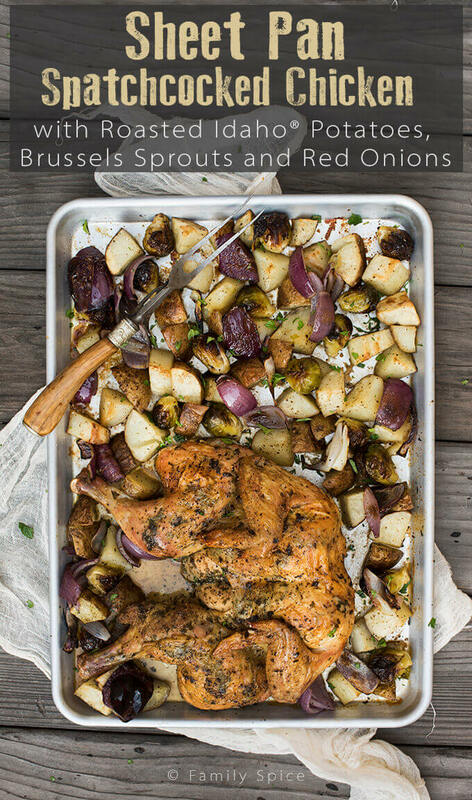 This One Sheet Pan Spatchcocked Chicken with Idaho® Potatoes and Vegetables is all it takes to feed your family. Using a large sharp knife, cut along one side of the backbone. Cut along the other side of the backbone and remove it completely. Spread chicken flat, cut side down, and press gently on the breast bone until you hear a crack. 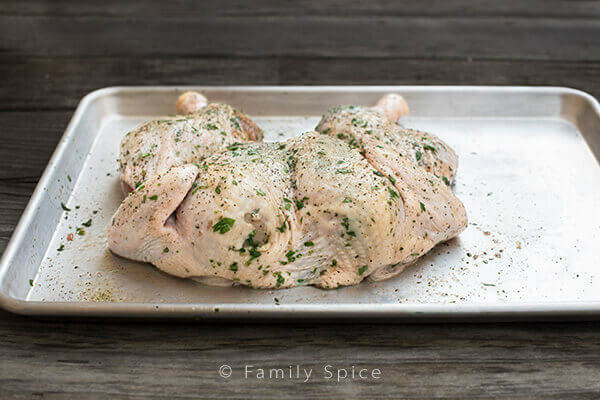 Lay chicken flat on one side of baking sheet, cut side down. Toss to coat evenly then transfer to baking sheet with the chicken, spreading potatoes to one layer. For even roasting, the vegetables should be approximately the same size so cut larger sprouts in half, as needed. After chicken and potatoes have roasted for 20 minutes, add Brussels sprouts and onions to the pan and return to oven. Roast for an additional 25 minutes, or until the juices from chicken run clear and has an internal temperature of 165ºF. Disclosure: I was paid a stipend to develop a recipe cooking Idaho Potatoes. The opinions I expressed in this post are 100% all mine. If I didn’t like it, I wouldn’t blog about it. Roasting brings out such great flavor!